From the moment you chose your house, either by designing it yourself or falling in love with it on your search as a buyer, you began creating a home in your vision. Why should your deck be any different? For a deck that will enhance your Bucks County PA home, check out our suggestions. Deck Building Bucks County PA Homeowners Love! Based on our experience as deck builders and homeowners, we’ve learned how to get maximum enjoyment out of our decks. From location to size to style, we can help you design the perfect deck. Most homeowners assume that they should have the deck right off the back door. And while that’s a convenient choice when it comes to easily taking meals and supplies from inside to out, that’s not always the best choice for your yard. If there’s a lot of sun in a certain area, extensive landscaping in another, or you already have a pool in place, you may want to think about placing your deck with these considerations in mind. Do I want storage on my deck? If so, how much? Storage for outdoor supplies is a game-changer and can make life much simpler! What will I do on my deck? Eat family meals? Entertain a crowd? Cook? Relax? Depending on the number of people you’ll want to have on your deck and how many ways you’re likely to use it, the size will change. Will one level suffice? Or do I prefer the option and appearance of multiple levels? One level is standard, but more than one level can allow for more flexibility. For the best of both worlds, we often recommend composite decking made to look like real wood. 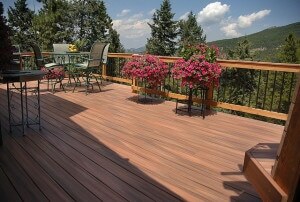 Composite deck materials are high quality and low maintenance. Unlike wood decks that require more maintenance and deteriorate more quickly overtime, the composite materials we use have a 30-year limited warranty with no annual sealing required. That means less deck maintenance and more deck fun! Call Harmony Decking For Deck Building Bucks County PA Homes Deserve! Haven’t you waited long enough to have your dream deck? Call Harmony Decking today and set an appointment for a free consultation. We are the local experts for deck building Bucks County PA homes deserve and we’d love to share our dynamic deck design ideas with you!